My client sends data in an Excel file to me to load them into Staging database. The file contains many sheets that they have same structure. In this article, I would like to share the simple way to load data of multiple sheets by using SSIS. For demonstration purpose, I have an Excel file which is containing sales data monthly. Each sheet contains data per month. If you could not install any Excel instance of Microsoft, you can download Microsoft Access Database Engine (choose 32 or 64 bit). The Excel file contain sales data from October to December in 2015 and there are 3 sheets of three months. They have same structure. ExcelFile: Excel file name. By default, we assign path of example file. SheetName: contains name of each sheet in Excel file. 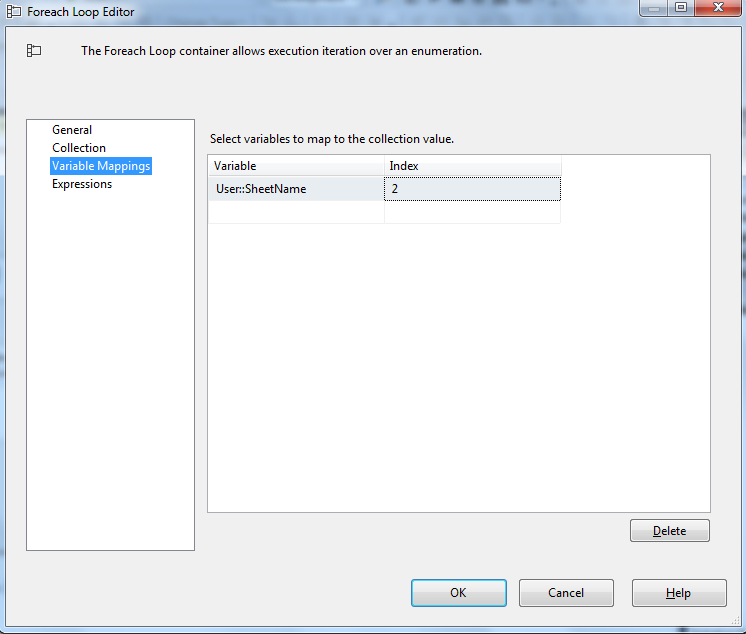 When SSIS package reads Excel file, it will scan every sheet and get sheet name, and then assign the value to this variable. Assign Sheet1$ by default. 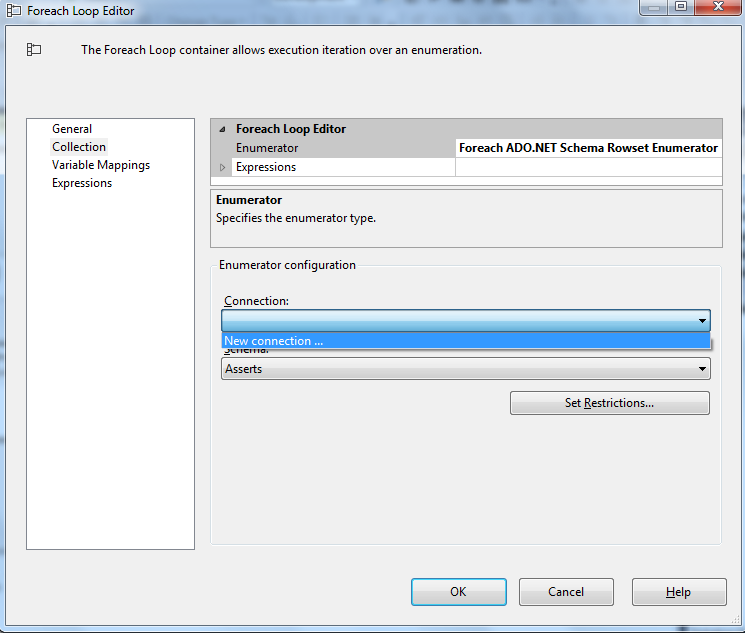 SSIS package uses the connection configurations to make connection, which we create them in Connection Manager pane. 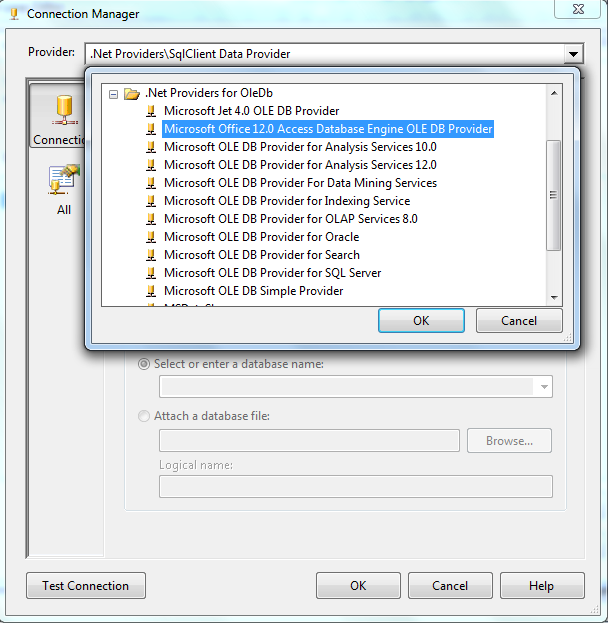 Create OLEDB Connection and assign OLEDBConnectionString variable to ConnectionString property. 4.3.2 Drag and drop Foreach Loop Container component. Double click to open Foreach Loop editor. 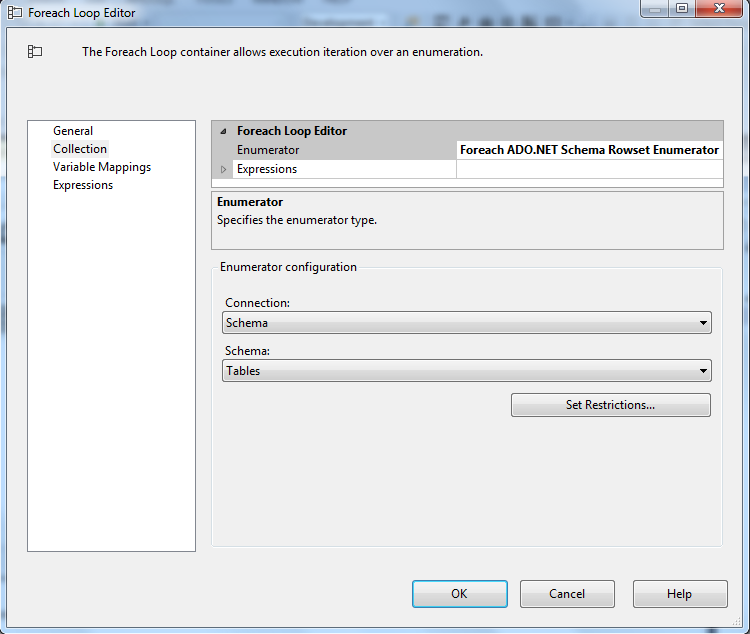 Enumerator: Foreach ADO.NET Schema Rowset Enumerator. This mode helps us loop through all sheets in Excel file. Configure ADO.NET Connection Manager window appears, then we click on New button. 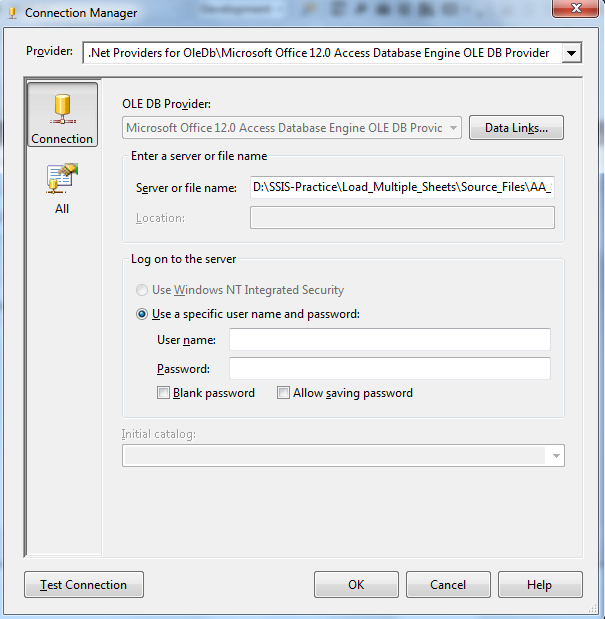 Connection Manager window appears, select Microsoft Office 12.0 Access Database Engine OLE DB Provider. Because the Excel file is 2007 (xlsx format), we need to select this option. 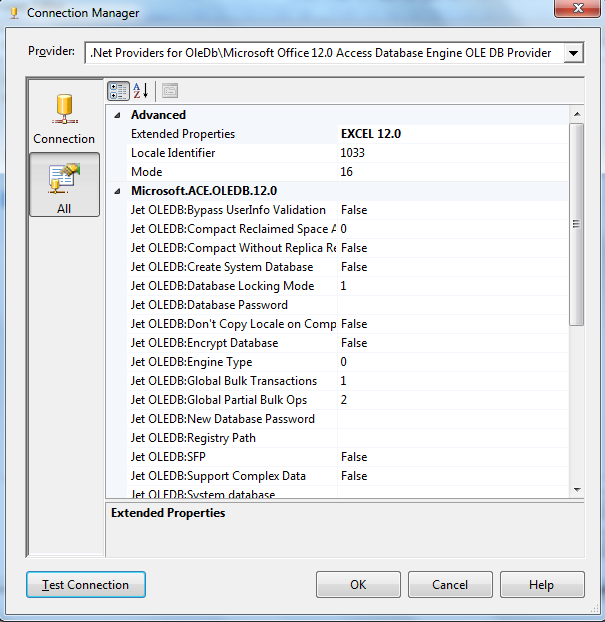 If Excel is lower version such as 2003 Excel, we select Microsoft Jet 4.0 OLE DB Provider. Double click on Data Flow Task. Drag and drop Excel Source component. Double click to open Excel Source Editor. On Column table: select columns we want to transfer data. In this example, we select all columns. Check data to make sure that they are inserted into the table successfully. There are 30 rows in result. The above package is very simple. Obviously, we will have many steps when we implement it in any real project. The purpose is to give you the solution in case you have to load data of multiple sheets of an Excel file. One of critical issues is Excel connection, maybe you will face to it. Make sure that you have Excel installed or you must install Database Engine, which I mentioned earlier.